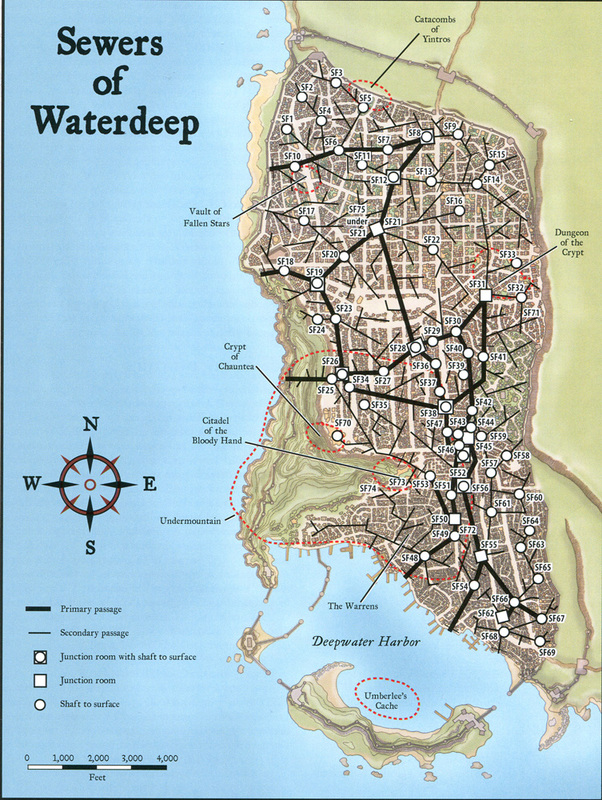 Waterdeep's sewers run beneath the entire city, with the notable exceptions of the harbor islands and the heart of Mount Waterdeep, forming a subterranean "dungeon" between the surface and the depths of Undermountain. The uppermost portions of the sewers are in present use and fairly good repair, thanks to the efforts of the Cellarers' and Plumbers' Guild. Many older, smaller tunnels are walled up and not in use - at least, not to carry sewage. The map shows only the largest passageways of the sewers. These are of two sorts - primary and secondary, according to size. Primary passages are 20 feet across and contain 3-foot-wide rail-less walkway ledges on both sides. Sewer workers cross passages by means of their 16-foot "catch-poles" to vault across or by the use of boards, which they lay down as temporary bridges. The catch-poles are also used for reaching below water level to clear debris from sewer gratings. Secondary passages are 12 feet across with a single 3-foot-wide ledge on one side (usually the more southerly or easterly). The countless feeder pipes (any sewer pipe less than 1 foot in diameter) and tertiary tubes (which can be crawled through by a Medium or smaller creature) are not shown. Junction rooms are usually 30-foot-by-30-foot stone cubicles, 20 feet high with a sitting ledge near the ceiling, above the muck. Surface shafts are 6 feet in diameter with iron rungs set in the walls to use as ladders to and from the sewers. The entrance to a surface shaft is a 3-foot-wide hole capped by a removable metal (or metal-banded wood) cover. The accompanying map is accurate, but some of its features (such as the junction rooms and surface-shafts) are distorted in size for clarity. The sewers themselves are unnamed, so those giving directions usually give them in relation to the point of entry. Waterdeep's sewers have masonry ceilings, walls, and floors. The floors are considered to be light rubble, thanks to all the debris that has been deposited over the years, adding 2 to the DC of Balance and Tumble checks. Air: The air supply is reasonably good (from a survival standpoint) in the sewers, as the numerous small feeder pipes bring stench-ridden air down from the surface in addition to refuse. Ambient Noise: The echoing water flow produces lots of noise, providing a -4 circumstance penalty on all Listen checks in the network. Disease: The sewers are filled with tainted water. Any activity that results in a character's nostrils, mouth, eyes, or ears getting wet requires a DC 16 Fortitude save to avoid contracting blinding sickness. Anyone injured by a slashing or piercing attack (including natural bite, claw, gore, and sting attacks) must make a DC 12 Fortitude save or contract filth fever. Creatures who have survived in the sewers for an extended length of time are assumed to be immune to both afflictions. Gratings: Sewer gratings are stout, but many are often old and rusty. They could be permanently set into stone walls or set to swing open on pivots when unlocked. Iron Gratings: 2 in. thick; hardness 10 (8 if rusty); hp 60 (30 if rusty); break DC IS (23 if rusty). Illumination: Generally, there is no light in the sewers except beneath a sewer grate, where the filtered sunlight is equivalent to an immovable torch. Scent: A terrible stench pervades the entire network, providing a -4 circumstance penalty on Survival checks for tracking when relying on scent. Tracking: Walkway ledges are generally coated in a thin sheen of slime, making them "firm ground" for purposes of tracking. The following locales are shown on the sewer map. SF1: Surface Shaft - entrance located under the trees in the interior of the block west (and slightly north) of the Seatrees Shrine in the Shrines of Nature ($5). SF2: Surface Shaft - entrance located in the northernmost corner of Sabbar's Alley. SF1: Surface Shaft - entrance located in the center of Shank Alley, just southwest of the warehouse that stands in the interior of the block. SF4: Surface Shaft - entrance located just south of the tree in Sniff Alley, south off the Street of Glances. SF5: Surface Shaft - entrance located in the central stand of trees in the southern end of Heroes' Garden. Note that halfway down this shaft is a secret door leading to the Catacombs of Yintros. SF6: Surface Shaft - entrance located under a lone tree in the alleyway west of the Eltorchul Villa ($22), south of Ivory Street and north of Pharra's Alley. SF7: Surface Shaft - entrance located in the mouth of the alleyway that opens north off Chasso's Trot, just west of Sul Street. SF8: Junction Room with Surface Shaft - entrance located in a cul-de-sac due south of the Jhansczil Villa ($14), across the road. SF9: Surface Shaft - entrance located under the tree in the alleyway just south of the Brossfeather Villa (N2). SF10: Surface Shaft - entrance located at the northern end of a dead alley that opens off Grimwald's Way, just south of the Ilitul Villa ($17). SF11: Surface Shaft - entrance located in the easternmost cul-de-sac opening off the alleyway that bounds the Nesher Villa ($23), just west off Mendever Street. SF12: Junction Room with Surface Shaft - entrance located in the alleyway just west of the gates of the Manthar Villa ($36), off Delzorin Street between Sul Street and Shield Street. SF13: Surface Shaft - entrance located in the large clump of trees in the interior alleyway of the block bound by Vordil Street, the High Road, Delzorin Street, and Copper Street. SF14: Surface Shaft - entrance located in the southeastern corner of Trollskull Alley, closest to the intersection of Whael-gund Way and Delzorind Street. SF15: Surface Shaft - entrance located in a cul-de-sac opening north off Horn Street, between Tower March and Whaelgund Way. SF16: Surface Shaft - entrance located under the trees in the dead-end alley in the southern interior of the block bounded by Delzorin Street, Vhesoar Street, Sulmoor Street, and Ilzantil Street. SF17: Surface Shaft - entrance located in the mouth of Sharra's Flight, where it joins the Street of Whispers. SF18: Surface Shaft - entrance located in a cul-de-sac opening northeast of Toalar's Lane. SF19: Junction Room with Surface Shaft - entrance located where Gothal Street meets Calamastyr Lane. SF20: Surface Shaft - entrance located in the southwestern corner of Runer's Alley. SF21: Junction Room (no surface connection) - located under the southern mouth of Cloaksweep Alley. SF22: Surface Shaft - entrance Ideated in the trees at the center of the block bounded by Hassantyr's Street, the High Road, Julthoon Street, and Copper Street. SF23: Surface Shaft - entrance located at the western end of Marlar's Lane (by the alleyway parallel to Tharleon Street). SF24: Surface Shaft - entrance located behind (due south of) Blackstaff Tower (C6) at the base of the rocky cliff-face. SF25: Surface Shaft - locked entrance opens onto the surface near the top of the rocky slope of Mount Waterdeep, at a point due southwest of Turnback Court. SF26: Junction Room with Surface Shaft - entrance located in Turnback Court. SF27: Surface Shaft - entrance located in the southwest corner of an alleyway opening south of Cymbril's Walk, between the Street of Silver and Warriors' Way. SF28: Junction Room with Surface Shaft - entrance located in the southwest corner of a dead-end alley in the block bounded by Lamp Street, the Street of Bells, Cymbril's Walk, and the Street of the Sword. SF29: Surface Shaft - entrance located in the northwesternmost junction of alleyways in the block bounded by Lamp Street, the High Road, Selduth Street, and. the Street of Bells. SF30: Surface Shaft - entrance located in the southeasternmost corner of an alley opening off of the High Road (the first north of Lamp Street, just to the west of Andamaar's Street). SF31: Junction Room (no surface connection) - located under the Grinning Lion tavern (N56). Note that it is possible to reach the surface by means of a secret door from this junction room leading to the secret stair that connects the Fireplace Level to the Grinning Lion's midden. Only the proprietor of the Grinning Lion knows of this secret door, because he installed it. SF32: Surface Shaft - entrance located in the northwest corner of an alleyway that opens off Golden Serpent Street and Nindabar street, just east of Mhalsymber's Way. SF33: Surface Shaft - entrance located halfway down Belzound Street. SF34: Surface Shaft - entrance located in the northern mouth of an alleyway opening south off Sevenlamps Cut. SF35: Surface. Shaft - entrance located at the intersection of Shadows Alley and Lemontree Alley. SF36: Surface Shaft - entrance located in the alleyway just north of the Pampered Traveler Inn (C11). SF37: Surface Shaft - entrance located in the wide alleyway between the High Road and the Street of Bells, north of Buckle Alley. SF38: Junction Room with Surface Shaft - entrance located under the House of the Fine Carvers (C21). SF39: Surface Shaft - entrance located in Spindle Street, just south of Selduuth Street. SF40: Surface Shaft - entrance located in the lane that parallels Irimar's Walk on the north, west of Theln Lane. SF41: Surface Shaft - entrance located in the alleyway of the three trees that opens west off Wall Way, just south of Andamaar's Street. SF42: Surface Shaft - entrance located in the alleyway just north of Ironpost Street, that opens west off Wall Way, at the point where it joins another alley branching to the north. SF43: Surface Shaft - entrance located in the trees in a dead-end alley just north of Costumers' Hall (T11). SF44: Surface Shaft- entrance located in the mouth of a dead-end alley opening east off the Street of the Tusks, just south of Burnt Wagon Way. SF45: Junction Room (no surface connection) - located under the alleyway that opens south off of Spendthrift Alley, just behind (east of) Thentavva's Boots (T12). SF46: Surface Shaft - entrance located in the cellar of the Unicorn's Horn (T15). SF47: Surface Shaft - entrance located in the alley just behind (west) of Olmhazan's Jewels (C29) between the High Road and the Street of Bells. SF48: Surface Shaft - entrance located at the end of a deadend alley opening south off Nelhuk's walk (just north of the intersection of Adder Lane and Gut Alley). SF49: Surface Shaft - entrance located in the southwestern corner of a dead-end alley that opens off Shesstra's' Street (just north of Blackstar Lane). SF50: Junction Room (no surface connection) - located under the westernmost intersection of alleyways off Snail Street, north of Shesstra's Street. SF51: Surface Shaft - entrance located in a cul-de-sac opening off of Belnimbra's Street, in the block bounded by Soothsayer's Way, Snail Street, and Rainrun Street. SF52: Junction Room with Surface Shaft - entrance located in the westernmost dead-end of Quaff Alley (off the High Road). SF53: Surface Shaft - entrance located just east of the Bell Tower (C46), on Soldiers' Street just southeast of Watchmen's Way. SF54: Surface Shaft - entrance located at the intersection of alley ways just north of the Three Pearls Nightclub (D18). SP55: Junction Room (no surface connection) - located under the wide part of Candle Lane, west off the Way of the Dragon. SF56: Junction Room with Surface Shaft - entrance located in the westernmost end of a dead-end alley opening south off Simples Street. SF57: Surface Shaft - entrance located at the intersection of Tsarnen Alley and Burdag Lane. SF58: Surface Shaft - entrance located in the mouth of a dead end alley, where it joins Quill Alley between the Wide Way and Nethpranter's Street. SF59: Surface Shaft - entrance located in the western end of a dead-end forked alley that opens east off Rivon Street, north of Spendthrift Alley. SF60: Surface Shaft - entrance located in a cul-de-sac opening east off the north end of Drovers' Street. SF61: Surface Shaft - entrance located halfway down Beacon Street. SF62: Junction Room (no surface connection) - under Grocer's Lane where it meets Snake Alley. SF64: Surface Shaft - entrance located in a cul-de-sac opening off the Rising Ride between Juth Alley and Caravan Court. SF65: Surface Shaft - entrance located in the wide part of the alley that opens south off Olaim's Cut. SF66: Surface Shaft - entrance located in the wide alley north of'Coach Street, just west of the High Road. SF67: Surface Shaft - entrance located in the alley just east of the former Prestar's Furniture (S54), east of Carter's Way and immediately south of Coachlamp Lane. SF68: Surface Shaft - entrance located in the cellar of the Spouting Fish (S18). SF70: Surface Shaft - locked entrance located under Piergeiron's Palace (C75). This shaft opens into a cellar guarded at all times by five guard members and one armar (see City Watch; an alarm on the wall near them is sounded whenever they see or hear anything suspicious from the sewers below. SF71: Secret Door - connects the secondary passage leading south from SF32 to the Dungeon of the Crypt. SF72: Lair of the Xanathar - located directly beneath the Philosopher's Court, just east of the Snail.Street and north of the Street of Curtains. It can be reached by way of two different secret doors into the sewers - one leading north from the secondary passage leading southeast from SF49, one leading west from the primary passage running roughly north-south between SF55 and SF56. It can also be reached by way of three different passages leading up into basements of the buildings above and a pair of tunnels that lead down into the Cavern of Eyes (UM LI). None of these connections is direct; each leads through a warren of trapped and warded passages just large enough for a beholder to make its way. SF73: North Entrance to the Citadel of the Bloody Hand - connects the secondary passage west of SF53 with the once-secret northern entrance to the Citadel of the Bloody Hand. There is now a guard station here, once used to defend Castle Waterdeep from attack from below and now used to keep the living spell legacies of Halaster's Higharvestide trapped within. SF74: South Entrance to the Citadel of the Bloody Hand - connects the secondary passages running north and west of SF48 with the once-secret southern entrance to the Citadel of the Bloody Hand. Otherwise identical to SF73. SF75: Drain of Madness - a collapsed section of the sewer floor in the dark, flooded depths of SF21 leads down to a set of now-flooded chambers built long ago as a storage vault by some forgotten merchant. These chambers are now the home of the Savants of the Dark Tide. The sewers of Waterdeep are home to all manner of creepy crawlers, as well as bats, rats, and other various small animals. Many varieties of slimes, molds, and fungi are also found in the sewers, including brown mold, green slime, and yellow mold. A wide variety of monsters are commonly encountered in the sewers as well. Many of these make their way through connections between the city's dungeons and the city's sewers. Many inhabitants of the city above also frequent the sewers, including members of the Cellarers' and Plumbers' Guild, merfolk from the harbor, solitary rogues, and various Agents of the Eye. Several unique creatures known to roam the sewers include the following: a deathshrieker created in the aftermath of Myrkul's destruction; the Eye itself (see The Eye), accompanied by a contingent of eyeball beholderkin and lurking stranglers; Xliilqil (LE doomsphere), who seeks revenge on the Company of Crazed Venturers for its destruction decades before; a long-missing contingent of the Cellarers' and Plumbers' Guild who vanished during the Time of Troubles (CN male cursts [augmented humans] commoner 1); and the Savants of the Dark Tide. As a party travels through Waterdeep's sewers, every 30 minutes it has a chance for a sewer encounter, as set out in Sewer Encounter Chance. Groups moving at half their best possible speed or slower are treated as using cautious travel. Parties cloaking both sound and light use the hiding column. Passageways are considered to be primary, secondary, or tertiary, as noted above. On the table, "Sewer Feature" refers to junction rooms, the immediate vicinity of sewer shafts, or other secret chambers (not shown) off a sewer passage. In addition, every time a party moves through a sewer feature, there is a chance of an encounter. If the party remains in a sewer feature for 30 minutes or more, there is a chance of an encounter coming to them every 30 minutes per passage connecting to the sewer feature. For example, if a junction room connects to a primary passage and two secondary passages, roll three times per half hour the party remains in the vicinity of the sewer feature. Where appropriate, determine class, race, and alignment of each character by using the NPC generation tables in the FORGOTTEN REALMS dungeon Master's Screen or in the Dungeon Master's Guide.